Department of Forestry, Wildlife and Fisheries, Federal University of Technology, PMB 2076, Yola, Adamawa State, Nigeria. Asibey, E.O.A. (1971). The present status of wildlife conservation in Ghana. 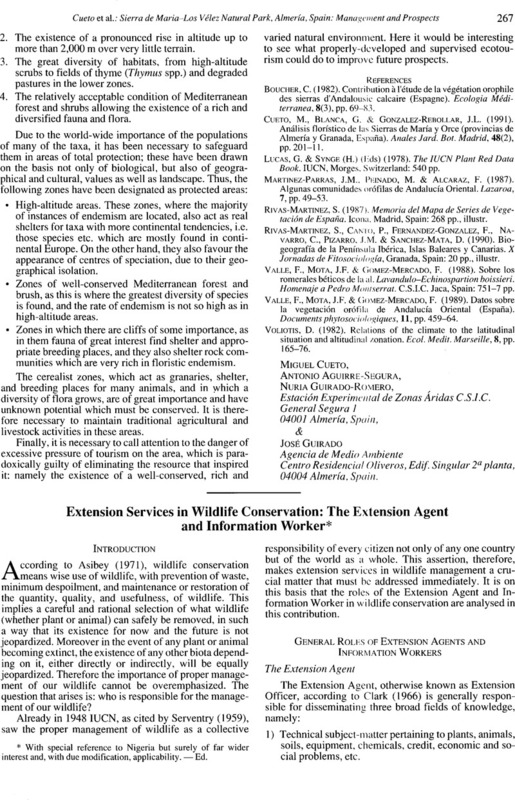 Wildlife Conservation in West Africa, 22, pp. 15–21. Clark, R.C. (1966). Agricultural extension as a profession. Nigerian Agricultural Journal, 3(2), [not available for checking]. Patel, A.U. (1973). Communication channels and their impact on knowledge of farmers of South Western Nigeria. India Journal of Extension Education, 14(1), pp. 3–4. Rosevear, D.R. (1959). The position of wildlife preservation in West Africa. Oryx, Vol. V, Nr 1, pp. 25–6. Serventry, V.N. (1959). The requirements of conservation programme. Oryx, Vol. IV, Nr 3, pp. 199–201. Williams, S.K.T. (1981). The Agricultural Extension Information Worker: His Methods and Materials. A paper read at FID/ET Technical meeting, Lagos, Nigeria, 22 pp. (typescr. ).